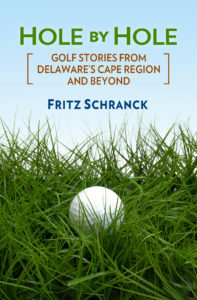 This week’s column returns to a regular feature, describing the golf courses in Sussex County, Delaware. Sussex Pines Country Club, southeast of Georgetown, opened as a nine-hole facility in 1967. Edmund Ault, the popular Mid-Atlantic golf architect, laid out the original course. The new nine, laid out by golf architect Al Janis, opened in 1989. Sussex Pines has a local reputation as being a bit tougher than some other courses around here. The regular tees measure 6450 yards, par is 72, and the USGA slope rating is 122. That’s about a stroke harder than average. Five of the holes are open to the elements. The other thirteen are primarily in the tall woods. Water comes into play on about six holes. For those having a really bad day, however, water comes into play on a few more holes. Wind conditions will usually dictate how easy the round will be. The renovated clubhouse is a beautiful facility. The club does a brisk side business in wedding banquets and other special events. The swimming pool is also popular with the members. Nonetheless, Farrell recognizes the club can’t simply rest on its laurels. A new committee, headed by Jim King, is planning renovations to the practice area, the drainage layout, and cart paths. Other changes have already occurred. Chris Popoli is the new head professional. He most recently worked as the assistant club pro for Sussex Pines, and signed the contract for the promotion to the top job this week. He also worked as an assistant at Shawnee Country Club in Milford. Popoli is looking forward to his new challenge. For those who want to play the course, there are several options. The club exchanges reciprocity privileges with local country clubs. Those who belong to an area club and want to play Sussex Pines may have their pro call Popoli and work out the details. Several charity events are scheduled for the season. Of course, members also frequently bring guests even when there are no such tournaments. The guest fees are $30 for 18 holes. Optional cart fees are $9 per person. Joining the club is another option. There’s no waiting list right now. However, there is a ceiling of 525 members with full membership rights. The initiation fee is $4,000. New members must also purchase stock in the club for $1,000. To make these payments more palatable, new members have the option to pay these two charges over a period of five years, at $1,000 per year, with no interest. The annual dues are currently $1,055, and the food and beverage minimum is $40 per month. The club is easy to reach from the Cape Region: west on Route 9, south on Truck Route 9, and follow the signs to Sussex Pines on County Road 324, also known as Sussex Pines Road.